That’s a good question. Last week I mentioned that a Ghostbusters sequel was on the way in 2020. So I had to ask myself, is that what I really want? Assuming this actually gets off the ground—Hollywood’s development hell can be exactly that—I’m just not sure. The original Ghostbusters, released in 1984, is a classic. You’d be sorely pressed to find anyone who didn’t enjoy it. 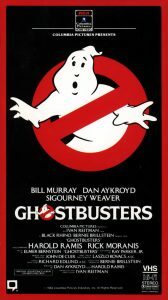 It scored big-time at the box office; it holds a 97 percent rating on Rotten Tomatoes; its popular theme song made “Who ya gonna call?” part of the vernacular; it ranks high on many “Best” lists. And a few years ago the Library of Congress chose the film for preservation in the National Film Registry, calling it “…culturally, historically, or aesthetically significant.” Quite a legacy for one of my personal favorites. With that kind of success you would have thought a sequel would follow posthaste. But other than an animated TV series, The Real Ghostbusters, which debuted in 1986, fans had to wait five years for the next big-screen installment. Was it worth the wait? 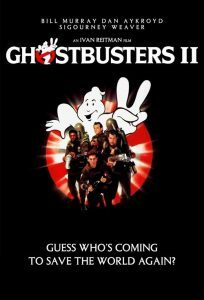 With that tagline, among a host of others, Ghostbusters II came out in 1989, because Columbia Pictures urged producer/director Ivan Reitman to do a sequel. 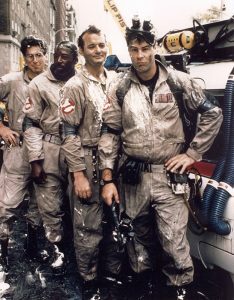 Reitman, along with writers/actors Harold Ramis and Dan Ackroyd, had not planned on making another Ghostbusters movie. But they ultimately came up with a script, and with all of the original characters in the fold, the film became a reality. 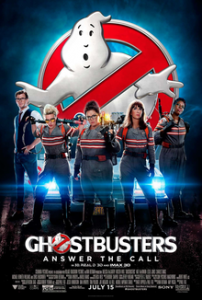 Like its predecessor, Ghostbusters II performed well at the box office. Unlike the original, the word “meh” summed up the reaction from critics and fans alike. Not bad, not great; not nearly as funny; some rehashing of the first story. Even Bill Murray griped that the film’s special effects—slime, slime, and more slime—were a bit much. As you probably know, I am easily entertained, and I always get a kick watching Ghostbusters II. (“Why am I dripping with goo?”) But, that’s me. And to be honest, I could see where the franchise had run its course at that point. Still, about a decade later Dan Ackroyd wrote a script for what he hoped would be the next film in the Spook-Verse. He called it Ghostbusters III: Hellbent. This effort never got off the ground, especially after Bill Murray said that he wanted no part of it. So it lingered in development hell for a long time, and in 2014, after Harold Ramis passed away, Reitman and the others gave up on the project. But with Reitman still in charge, the decision was soon made to reboot the series, one reason being to appeal to a newer, younger audience. A new director/writer, Paul Feig, was hired, and he announced that the reboot, alternately titled Ghostbusters and Ghostbusters: Answer the Call, would have an all-woman cast. Feig especially wanted what he called “hilarious women,” and wow, did he hit the jackpot! He chose Melissa McCarthy, with whom he’d worked many times before, and three of her Saturday Night Live colleagues: Kate McKinnon, Kristen Wiig, and Leslie Jones. Feig even got most of the remaining original cast members—yes, even Bill Murray as a ghost debunker—to appear in cameos as different characters. This looked like a “can’t miss” production. But social media being what it is, a campaign of negativity arose immediately after the announcement of an all-woman cast. The director, as well as the pre-production film, were vilified by fans of the original two movies. Many of the comments were of a misogynistic and anti-feminist nature, while others, with regard to Leslie Jones, an African-American, might have had to do with racism. This was supported by what occurred after the film’s release, when Jones was subjected to a Twitter campaign of both sexist and racist abuse. Ghostbusters: Answer the Call opened in the summer of 2016. Despite the controversy, its reviews were mostly positive. Test audiences of all ages gave it a high score, and an even higher score came from kids eighteen and under. Personally, I totally enjoy this reboot, and I would have been pleased if it led to a sequel. A post-credits scene has Patty (Jones) listening to a voice on a recording, then asking the others, “Who’s Zuul?” Perfect setup! Unfortunately, the controversy doubtless kept people away from the cineplexes. Its lofty production costs necessitated a worldwide gross of $300 million just to break even, but it fell short of that and is considered a box office bomb. Looks like Patty’s question will not be answered anytime soon. So it should be interesting to see what this oft-promised sequel will turn out to be. Will a longer-in-tooth Peter Venkman, Ray Stantz, Winston Zeddemore—maybe even Dana Barrett—be rushing to the scene of weird disturbances? Will Janine Melnitz answer the phone in typical NYC style: “Ghostbusters, whaddya want?” Or will the old guard be handing the Ectomobile off to a whole new generation of paranormal investigators? Whatever it turns out to be, I hope they do justice to one of the best films ever, the original Ghostbusters.